I’m a morning person, which means I’m up before dawn at this time of year and I get to watch the world outside awaken through the windows overlooking my backyard as I write. It’s not uncommon to see a few deer emerge from the woods and saunter by on their way to wherever it is they go, and while I generally think of all deer as road hazards and yard pests at this point (don’t get me started on how much landscaping I can’t have because of them), there are mornings when I watch them passing by and feel a little bit of envy. I imagine that the deer, along with all the squirrels and rabbits and birds inhabiting my yard, all seem to live such an uncomplicated life. No possessions, no expectations. The only goals they have each day are to eat, rest, avoid danger and disease, and procreate if possible. Generally just stay alive, and roam where and when they want in the meantime. There is no expectation that these creatures must somehow leave their mark in the world, no pressure to be productive with their lives other than to live. Just by looking after their own basic needs they are playing their role in the ecosystem they inhabit and that’s all that is needed of them. So why isn’t that enough for us humans? Why do I feel myself caught up in a growing awareness of “productivity” as a thing that matters; that it’s important to make my life count for something by doing or making things with my time to somehow prove I am contributing to the world? I am compelled to aspire toward greater productivity, but find it hard to explain why I’m compelled—it’s just part of what makes me human. It must be part of our nature as a species to continually strive for bigger and better, faster and smarter. We’re already at the top of the food chain, so in a broad sense we don’t have to compete for the basic resources in the same way as the deer. Instead, we compete and show dominance over information, measured through productivity. Knowledge is power, so our desire for information is strong. The growth of the connected era means our access to information is faster than ever before. Along with that, the amount of information we access has also increased. We are now able to be aware of more of what is happening and what is being shared in the world than ever before, and as we become more aware of all this stuff constantly happening we lose the ability to keep track of it all. The information never stops. There is no conclusion to our broadcast day on Twitter or Facebook. There is no waiting until 8:00 pm to catch a show when it airs or you miss it. We’ve lost the natural filters of press times, broadcast schedules, and factory whistles, and along with them we lost the natural limitations that actually may have been making us happier. While they seem inconvenient now, those barriers to information-on-demand limited our options in ways that I’m already feeling nostalgic for. If you missed something, you missed it, or maybe you never heard about it at all. And that was okay, because there was nothing you could do to wind back time. And if you were experiencing something, you experienced it totally, free of worrying about how to share it on social media. We had social experiences, and we had media experiences. It’s basically impossible for those two things to not overlap anymore. We’re solidly entrenched in the “information worker” era, where many of the decisions that used to be made by others about when and how information becomes available is now in the hands of each of us as individuals. And while that freedom is amazing and powerful, it also means our perception of time has changed, and our capacity for deciding how to leverage our own productivity with the time we’re given is not something we’ve necessarily trained for, or maybe even biologically evolved for. But does that mean too much information or aspiring toward productivity is bad? I certainly don’t want to get rid of the internet. And I don’t know what I’d do without my iPhone or email or web browsers. I love having access to information, and the possibility of sharing ideas and connections to thousands. But I’m still learning how to put up the barriers I once took for granted. 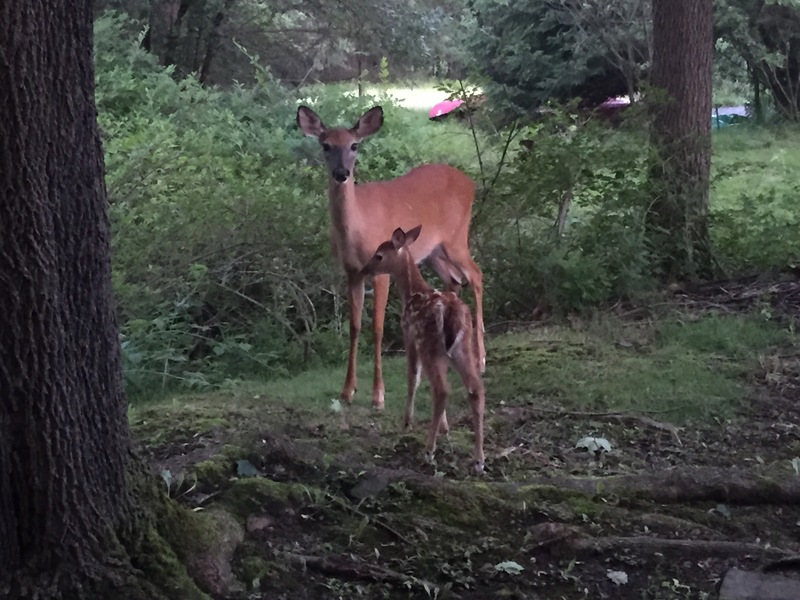 Perhaps it would be good to focus less on measuring my productivity based on output, and aspire instead to being a little more like the deer in my backyard: eat, rest, exercise, and avoid danger. Generally just stay alive, roam where and when I want to with mindful purpose. I want to remember how to just hang out in the world, doing my part for the ecosystem I’m in by being the best human I can be. Reading this post and taking a moment to just be. Just be me.